I'm in the research phase of definitely entering the industry. I spent nearly 20 years as a meat cutter then moved onto a relatively short career in Human Resources (5 years). Along the way, I did some retail management as well. Trucking has sort of always been in the 'blood'. My step father worked for 20 something years for Consolidated Frieghtways out of Chicago and then bought a truck and ran until diabetes got the best of him. Many of my cousins on his side drove and drive today. One is a pretty successful fleet owner and broker. Anyway, I'm preparing to go through one of the Tech Colleges up here for my Class 'A' CDL, then on to one of the big carriers in the area. Really looking forward to the whole experience. I intend to be one of those who takes every load and runs as hard as possible. I'm a safety conscious professional who is very confident in my success potential. I can barely stand the down time I'm experiencing now, since my position was eliminated. I'm unemployed for about 3 weeks now. Looking forward to meeting more of the driving pros like the ones I've met in recent weeks. After H.S. and the U.S. Army, I worked as a truck tire mechanic for an independent Goodyear dealer in Chicago Heights, became a butcher and supported my family that way for about 18 years. I went back to school, during which time, I worked as an environmental services supervisor at the VA hospital, then a retail store manager. For the past 5 years, I was an H.R. manager for a large commercial cleaning company. After some corporate shenanigans, my job was eliminated. Finally, my kids are grown and it's my turn to do what I have always wanted to do. If I may; what triggered your sleep study in the first place? BMI? Neck size? Admitted symptoms? I could not agree more. I was really bummed out when I got the first denial and then after I was told nO for the second time because of the apnea. Immediately after I got that second no I knew I needed to act fast and get a hold of my Dr office to get this going. All I can say is I'm a. Lucky guy. Having done the study been diagnosed and knowing.I would need a cpap she was willing to order an autopap for me so that I can get started with compliance. You do however, state that you have taken and passed the DOT physical. That indicates that you can indeed continue with schooling and I assume you now have your CDL permit. I was in a similar situation, except that I was flagged for sleep study at my DOT physical. My DOT examiner was very confused about the direction she was getting from the DOT/FMCSA about the sleep apnea/CPAP issues. I was diagnosed by the sleep study with a mild case of apnea, far below the threshold which the DOT is concerned with (FAR BELOW). She still insisted that Federal regulations state that I must start CPAP treatment in order to get my first 30 day FedMed (this is very untrue and there are NO Federal laws or regs stating such). I gave her proof that she could not accept. Side note: I made an official complaint with her organization. She no longer works there. Long story. After receiving the diagnosis and subsequent "treatment" of virtually nothing (I was told to avoid sleeping in the supine position), the DOT examiner rejected this "treatment". All of this is happening just days before I needed my permit so that I could continue with schooling. To make a long story short, the sleep doctors asked me to come back in for further discussion. In the end, they gave me the option of purchasing a CPAP, for which my insurance covered, though barely. I was told that technically, my mild case did not even qualify for CPAP therapy!!! At any rate, I took the treatment and began using the thing because the DOT examiner was not budging. I was running out of time, patience and money! I am now in compliance (as of yesterday) and have received another 30 day FedMed. I start orientation on Monday at the company that ended up at the top of list from which to chose! I am insanely grateful for that! When I explained all of this to the recruiter, he simply said that I would have to wait to participate in the orientation until I was in compliance (the 30 day thing), otherwise, I would have started with them a couple of weeks ago. Also, the first thing that is scheduled for Monday, is yet another DOT physical, paid for by the company. Even though my current FedMed is now eligible to be upgraded, it doesn't matter. The physical I take on Monday will be the determining one. I hope that makes sense. In other words, I will just bring my sleep study results and my documented compliance along with me on Monday, and I expect a one year FedMed card at that time. In fact, I am hoping that the DOT examiner actually reads the results for what they are, and lets me off the hook with the CPAP machine. Please keep in mind, I may be a bit of an anomaly because I truly don't need the machine. In my case, it has only hindered my ability to get a good night's rest (as I always have). I just "sucked it up" and took my lumps and got my CDL and a job. The rest, I'll worry about later. I do however see where CPAP therapy would make an enormous impact on one's quality of life, even if they are currently unaware of the problem they may be having. I want to make that point very, very clear. In fact, even if I can get the diagnosis / treatment under control, I will keep my machine and continue to try and get accustomed to it and perhaps even continue using it, at least from time to time. I just don't want to be strapped with proving compliance if I can get away with it. I know that seems odd, but I want to cut this short, rather than try to explain further. So, to you and others in similar situations: Hang in there, do what you have to do in order to get from point A to point B. CPAP is not the end of the world. Be persistent and keep moving forward, despite the delay. It will pay off in the end. CDL w/H+N in hand, orientation / training starts on Monday! It's been some kind of ride, all made more humorous and a lot less stressful by creeping and learning on TT! My CDL journey began sometime in December, 2014, shortly after my Human Resources job was eliminated. After jumping through the hoops (some that were on fire), and after having the resilience of a super ball (remember those?? ), I am finally moving on to the critical phase! Orientation and training begins on Monday - my heart is beating out of my chest in anticipation. I think I have chosen well and have a very good feeling about the company with whom I'll start my driving career. As time goes on, I will do my best to chime in with some experiences. I have to say; along with the tutorials and technical information within TT, one of the greatest assets to new drivers, is hearing of the experiences of other new drivers! I'll try and 'pay back' some of those assets that I've acquired from here! I have some more, very pertinent info to add about the whole sleep apnea debacle, but maybe I'll save that for future down time. Right now, the issue has my brain drained. All is well however, and my attorney will take it from here. The DOT examiner "no longer works for the clinic" by the way, so that particular problem has been solved. Thanks again to everyone on TT for your professionalism, tact, and selflessness. To Brett and fellow Moderators: Thanks for keeping it that way - it's a rare find. b> Take care! I'll be in touch! Joe R.
So in training the instructors hammer it into your head to double clutch and I know I need to for the test but how many of yall actually double clutch when you're on your own? Funny thing Mike; my CDL school instructor would not even allow us to practice double clutching - we only floated gears and skip shifted. Typically, we would start in third, float to 5th, 7th, 8th, 9th, 10th, then back down the same way. The 3rd party examiner for the road test wasn't exactly thrilled, but as long we demonstrated control, he was okay with it. I'm hoping it's okay with my trainer when I actually accept an offer. I'm sure I can double clutch just fine, but have had zero experience doing so. DOT Physical, what are the requirements? CPAP has to be the kind that LOGS USEAGE - and you have to use it at least 4 hours per night - EVERY NIGHT and be able to PROVE IT (including the 30 days prior to your physical. You will need a LETTER FROM YOUR TREATING PHYSICIAN stating that your condition is stable, and you are able to OPERATE A CMV SAFELY. Diabetes - if you are INSULIN DEPENDENT - you will need to apply for a WAIVER. You will need a LETTER FROM YOUR TREATING PHYSICIAN (endocrinologist) stating that your medications are stable and well tolerated, and your sugar is under control, and you are able to OPERATE A CMV SAFELY. High BP with meds - you MUST BE UNDER 140/90 - You will need a LETTER FROM YOUR TREATING PHYSICIAN stating that your medications are stable and well tolerated, and your blood pressure is under control, and you are able to OPERATE A CMV SAFELY. You've got like a TRIPLE WHAMMY HERE - you are going to need to be SPECIFIC ABOUT YOU CONDITION(s) with any recruiter you talk to - and have them double check with medical/safety. Some companies DO HAVE some PHYSICAL AGILITY TESTS - and may do a treadmill test also - they will MONITOR YOUR BP - and your ability to be physically able to perform your job functions as a driver (climbing in & out of the truck/trailer, doing pre-trip inspections of truck & trailer, etc.). Many companies will not want to risk taking you on - with SO MANY MEDICAL CONDITIONS. If ANYTHING - it's the DIABETES that's going to present the biggest issue. If you are on the needle, you are going to have to go for a WAIVER/EXEMPTION. I can't really speak to the rest, but with the CPAP compliance, it is a minimum of 4 hours per night, for 70% of days (not necessarily EVERY day). That is the DOT/FMCSA recommendation. Individual companies may require different standards of use, but it's unlikely. To the OP: Trust me when I say that there are many hoops to jump through, getting into this biz (Some hoops may be on fire). Health issues, particularly the ones that you've mentioned, are only a few. Go for if you are prepared to jump and scramble. And in response to your thread title, I didn't find it a PITA when getting my hazmat. Thanks for the intelligent response to that somewhat incoherent post. My HM endorsement was not a pain either. I studied the material and did my best to underunderstand the material, then simply passed the test, submitted fingerprints and collected the subsequent mail. ......brrrrrr, tough stuff. So as many of yall know last year I was invited to my companys Allstar Banquet. Its for the top 50 drivers in the company. Well guess who was invited again for the second year in a row Yep you guessed it ME! Good stuffins, RedGator! If I recall correctly, and you are still with the same company, I will be joining you in mid-March. My road test is tomorrow and I have a tentative offer from them, pending the background check (no trouble there). I have officially whittled it down to 2 companies and will most likely go this route. I cannot help much with your question, but I do have a question for you. First, thank goodness you've earned your stripes and have a few years under your belt before taking this leap! My question is this: Why? What, in your assessment would be different, beside the obvious? The reason I'm asking is, I wonder if it's a matter of having more freedom in/with your truck, as opposed to having to follow company rules in terms of what you can have in your tractor and how things are governed? I'm curious because I intend to consider something similar, but certainly not until I company drive for several years first. Is it a pride thing for you? Is it an entrepreneurial spirit? A combination? What's your motivation for considering a lease? This is just an observation. I was born and raised in the Chicago area but have been long gone from there since 1988. I visit there and northern Indiana frequently. Two things: First, you mention that you'll be traveling on Sunday afternoon. Drive through town and enjoy! It's Sunday, my friend. While there are no guarantees in that fine city, I doubt that you'll encounter anything too significant. Even if you were traveling during the morning rush on Monday, if this is intimidating in your 4 wheeler, what will you do when you get into a truck? Unless you get extremely lucky, you will almost certainly find yourself navigating through much worse traffic than in Chicago. Despite what you hear, Chicago traffic is very navigable for a responsible driver in any sized vehicle. I wish you the best at Roehl. They are in fact on my short list of companies for when I finish private CDL school. The sleep Dr. has recommended no treatment and no follow up appointments. She simply suggests that I lose a few pounds and avoid sleeping on my back (you might recall that I had 18 minutes out of 9 hours where I slept on my back and apneas increased slightly). Without divulging the name of my health care organization, I will say that they are affiliated with one of the most respected Medical Universities on the cutting edge of medicine in the country. Conversely, the DOT certified Nurse Practitioner who did my exam, works for another, not so highly touted health care organization. With no other symptoms beside BMI, and my low scores from the sleep study, she reports that while borderline Sleep Apnea exists (by the mildest of standards), my insurance company would not even consider me a candidate for CPAP. Now waiting to see what the NP who did my exam does with this information. It should be interesting, but a 1 year card seems to be her only option at this point. I cannot imagine how she would be able to justify anything less. The moral to the story: A diagnosis of OSA does not necessarily mean that CPAP is the answer, no matter how much they try and tell you it's the law!!! Don't let this happen to you if you can avoid it. Demand justification if your AHI proves to be fewer than 15. Know that the standards are being implemented in order to pay for their overpriced sleep study programs and not necessarily by what DOT/FMCSA recommends. If particular companies have implemented their own standards, that is a different story. Drivers have no recourse there and must abide by company policy or move on. At least now, I have documentation to carry with me and an incredible motivation to lose weight a little faster. Going to meet with the sleep study MD today. My diagnosis of OSA was made based on 5.8 apnea per hour. That is a very mild case when compared with the DOT/FMCSA panel of expert's "primary focus", to identify drivers with an AHI (apnea per hour index) of 15 or more. The focus is on those with "moderate to severe" apnea. Unfortunately, the DOT examiner who did my physical, after having received a "diagnosis" of OSA, then demanded that I begin CPAP therapy. I nearly jumped through the phone while telling her she was misinterpreting this and other portions of her responsibility as a health care professional. I told her this is unacceptable and I would need to speak with her director. To make a long story short, she decided that she needed to talk with her Director and would call me back. All the while, now agitated and calling me Mr. rather than Joe. She called back finally and said that if the Sleep Dr. "prescribes" treatment that does not include CPAP (which they will), and sends her a letter stating such, she'll give me a 30 day card. I asked, then what? She replied, after 30 days, they will have to confirm that you have been compliant and then a 90 day card will be issued, etc. Just like the requirements for CPAP, but in human form and not via smart card. So, in my meeting with the Dr. today, I will ask for a revision to the diagnosis and it should read "mild sleep apnea" and well under the standard definition of "moderate to sever" as is the focus of the DOT. No restrictions or specific treatment is warranted, only lifestyle changes (lose wt., stop smoking, exercise). Any responsible health care professional would issue a 1 year card, rather than going the typical route. We'll see. Sleep apnea is a serious condition and should be treated as such! Just be careful that your examiner and subsequent sleep tech/MD is interpreting things correctly so that you are not subject to be tied to this machine for the rest of your professional lives, based on misinterpreted guidance, remembering that there is no legislation regarding truck driving and CPAP machines! The guidance however is somewhat clear, as you can see in the bulletin posted originally. On the other hand, take the treatment if you feel that you will benefit from it as so many have. I will not benefit from it. I sleep well and have absolutely no other symptoms. I'll let everyone know what happens after my appointment today. One thing that is certain, I will not be purchasing any sort of machine. Is there a standard deduction for supplies? Generally, you can use the “standard meal allowance” method as an alternative to the actual cost method. It allows you to use a set amount for your daily meals and incidental expenses (M&IE), instead of keeping records of your actual costs. The set amount varies depending on where and when you travel. In this publication, “standard meal allowance” refers to the federal rate for M&IE, discussed later under Amount of standard meal allowance . If you use the standard meal allowance, you still must keep records to prove the time, place, and business purpose of your travel. See the recordkeeping rules for travel in chapter 5 . Incidental expenses. The term “incidental expenses” means fees and tips given to porters, baggage carriers, hotel staff, and staff on ships. Incidental expenses do not include expenses for laundry, cleaning and pressing of clothing, lodging taxes, costs of telegrams or telephone calls, transportation between places of lodging or business and places where meals are taken, or the mailing cost of filing travel vouchers and paying employer-sponsored charge card billings. Incidental-expenses-only method. You can use an optional method (instead of actual cost) for deducting incidental expenses only. The amount of the deduction is $5 a day. You can use this method only if you did not pay or incur any meal expenses. You cannot use this method on any day that you use the standard meal allowance. This method is subject to the proration rules for partial days. See Travel for days you depart and return , later in this chapter. There is a standard deduction for food while on the road, but as far as I can tell, you will need to claim everything else individually and yes, keep all receipts, although for the standard food deduction, just being able to prove that you were truly on the road for the days being claimed is all that is required. You'll have to look up the standard deduction. It's between $50 and $60 per eligible day on the road (typically meaning 'full days'). This is all off the top of my head, so please don't consider this to be sound advice from any sort of tax professional - please do your official research. 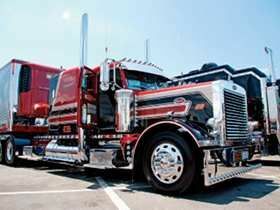 An OTR driver can claim nearly everything from glass cleaner and paper towels to beets and burgers. Yes, even company drivers! Just be sure that what you claim is not reimbursed in any way. You cannot claim clothing that can be easily utilized as civilian clothing either. You can however claim uniforms (if they are not provided, but required). Exactly, and my neck size is 16 1/4. I was sent to sleep study based solely on BMI with zero other symptoms. While I appreciate knowing now, that I get higher quality rest by sleeping on my side rather than on my back, there is hardly justification for strapping myself to a $3000 machine for the rest of my professional life. In fact, my BMI was recorded at 33.8. .2 below the threshold. She simply determined that it was borderline and close enough to cause concern. With that, she is holding my medical card. I am sure they were surprised and disheartened to learn that I took my sleep study business elsewhere. You're right. There is the notion of a scam. The truth is, these organizations developed their huge sleep study programs after the the FMCSA announced the initiative back in 2000. The idea was this mandate would be a cash cow in coming years. Unfortunatly for them, the legislation never happened as promised. There are now sleep study programs all around the country that need to be paid for. Hence, the tighter standards were imposed on providers by thier respective organizations. They use the FMCSA as an excuse and manipulate the information provided in order to coerce drivers into believing that they have no options. That is wrong and will almost certainly be dubbed illegal at some point in the future. There will be litigation. I don't have the answers, but the solution to sleepy driving will not be resolved in this way. It is rather interesting that the "panel's" baseline for determining whether sleep apnea's severity is at a level which may affect a person's major wake time is equal to or greater than 15 apnea or hypopnea per hour. The sleep doctors are closer to 5 or more before diagnosing OSA. The point is, many more drivers are being diagnosed than even the panel of experts recommend. Who knows how many? I just want to clarify that I started this thread with the intent for it to be informational, rather than a rant. I read some of what I wrote earlier and realized it was beginning to sound like ranting. I apologize for that! In the end, to all those affected, try not to fold under the pressure and ask questions if/when you are ordered to a sleep study. Consider referring to your primary physician if you have one, but at the very least, question the person performing the exam and making the decisions on your medical card. This is an ongoing issue with the FMCSA and others. Until it is resolved, drivers and prospective drivers will be caught in the middle. For us, it is a game changer and is having an impact on thousands individual livelihoods. Personally, I don't take medications or therapies unless I've exhausted all other remedies. I will not be forced by any government entity to alter that standard. Oh, and by the way Rick, the magic BMI number is actually 34 (although it may be 33 now). I have never seen a number like 39 in all my research. Similar to many other discrepancies within this mandate, however, there could be dozens of BMI standards floating between providers; I don't know. I'll let the forum know how this turns out, just in case anyone finds themselves in a similar situation. I'm waiting to hear back from the nurse in terms of how she will interpret the results of the sleep study. In the interim, I will try to get my physician to prescribe "position therapy" and I'll simply wear a fanny pack sort of thing to keep me from rolling onto my back. That should be considered appropriate treatment. There isn't now and never will be legislation that demands CPAP treatment for every trucker diagnosed with a mild case of sleep apnea - ever! Trust me Rick, I am the first to admit that I'm not at my prime wt. at 228 lbs and 5' 9" even though, up until nearly 2 years ago, I was a complete gym rat and my muscle far outweighs the average 48 year old dude as compared to the fat. I have put on some unwanted pounds, but I don't fall into the "typical category" and I am by far, not the only one. The concerns are genuine and deserve a look! While everyone cowers away from the issue, drivers are being cheated from the truth. Here is the latest: I just received my results from the sleep study. To make it short, MY sleep doctor considers my apnea a mild case. In fact it recorded only 5.7 apneas per hour. Those who want to dig can look-up the DOT's so called recommendations to see how low that truly is in their minds. For 18 minutes, I was on my back and recorded an average of 45 apneas per hour!!! Wow!! Now, while CPAP is the standard "go to" for even my case, there is also the recommendation for "positional therapy" - I think that describes itself (no machines, just maybe a device that keeps me from rolling onto my back). The million dollar question: Once I report this to the DOT certified Nurse Practitioner who is awaiting the results and holding my med card; how will she react? Will she sign off? 1 month? 3 months? 1 year? Hmmm.... DOT and FMCSA doesn't tell her whether that's acceptable. How will she be able to monitor this therapy for compliance? My guess is that she'll try and force the CPAP on me to protect herself and I'll have no other choice but to comply. Well, there is one other choice, but not going through with my plans to drive OTR is unacceptable to me. More than one driver has compared it with being raped. I'm not sure I would categorize in that way, but it sure feels like we're governed by juveniles.